In his Foreword to Helen’s autobiography Seize The Moment, Arthur C Clarke writes “Her account of the hours before the launch and the actual sensations during ascent into orbit is so gripping that any reader will feel a vicarious involvement. This is exactly what it must be like”. On 15 December 2015, Britain’s second astronaut Major Time Peake began his mission to the International Space Station (ISS). Helen joined Professor Brian Cox and Dara Ó’Briain on BBC TV’s Stargazing Live to follow the live docking of the Soyuz rocket with the ISS. She was invited back on 18 June 2016 for Tim’s safe return to Earth. After MIR, Helen became a science communicator and corporate speaker, winning numerous prizes for radio and TV programmes and for her inspirational talks on teamwork, STEM, science communication andmotivation. Helen often meets teachers who were inspired to study Science after hearing her speak: her speech changed them, and now they pass on their passion and expertise to new generations of young scientists and engineers. Responding to that radio advertisement, Helen was one of only two Britons selected for astronaut training. 13,000 people applied. Helen didn’t think she stood a chance of being chosen. But she was just the type of calm, steady, practical, friendly, professional they were looking for. The programme, named Project Juno, was a co-operative arrangement between the Soviet Union and a British company set up to manage the Mission. Helen underwent a rigorous selection process with psychological and medical assessments, technical understanding and practical skills. This was followed by 18 months of intensive flight training in Star City near Moscow. She first had to learn Russian, as all the training was conducted in the Russian language. She met and got to know the cosmonauts’ families, along with preparing for weightlessness, learning how to cope inside a cramped space capsule, G Forces, how to deal with a landing in the sea and training for all the possible scenarios which might happen in a spacecraft, in orbit, travelling at 17,500 miles an hour. During the launch, Helen carried out spacecraft operations. Once in Space, her tasks included medical, agricultural and chemical experiments, materials’ testing, Earth observation work and operating an amateur radio link with British school students. She also did media interviews and had an unexpected live telephone conversation with the Russian President, Mikhail Gorbachev. Coping with risk was a daily activity. Teamwork was a vital element in the success of the Mission. Helen was aged 27 when she became an astronaut. Helen has not returned to Space but, like every other astronaut, she would love to go into Space again, experiencing the weightlessness, the camaraderie ……... and the views. Born in Sheffield, Helen Sharman received her BSc in Chemistry at Sheffield University. She worked in Research & Development for GEC before moving to Mars Confectionery, where she became a Research Technologist working on chocolate and ice cream. More recently, Helen managed a research group at the National Physical Laboratory in London. She now works full-time at the Department of Chemistry, Imperial College University of London. Helen recorded the Audioguide for the acclaimed Cosmonauts exhibition at the Science Museum, London. In July 2015, she spoke at a special event for children (aged 5-95!) at the Royal Institution in London. Co-presented by TV presenter Dallas Campbell, the event was entitled To Infinity and Beyond: the story of the spacesuit and it included part of Helen’s own spacesuit, generously loaned by the National Space Centre in Leicester. 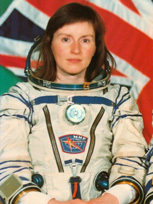 Helen Sharman was awarded the OBE for her pioneering work in 1993. She has received Honorary Degrees from eight Universities. In 2015, Helen was appointed President of the IST (Institute of Science and Technology), where she makes a significant contribution to the technical community. 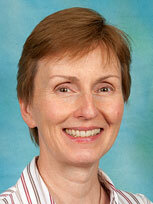 Formerly a Trustee of the National Space Centre, Helen is a Patron of Spacelink Learning Foundation. She is a very active member of the Association of Space Explorers (whose members must have completed a full orbit of the Earth in order to qualify for membership). She was awarded the Friendship of the Soviet People Medal from the Soviet Union and the Medal for Services to Space from Russia. A space suit worn by Helen is on display at the National Space Centre in Leicester, England. For her accomplishments in Project Juno, Helen received a star on the Sheffield Walk of Fame. As Helen is an inspiring and highly engaging role model for young people, many schools have named Houses and Laboratories after her – including in London, Kent, Rugby, Leeds and Hartlepool. Space is genderless. Our audience were captivated, listening to Helen. Thousands of hopefuls applied but the final selection was based, in large part, on how well the astronauts worked together. Helen was chosen, and broke new ground for Britain. She told us that she was motivated to do a good job, to the very best of her ability, and to enable others to do the same. And that true leaders are in fact “enablers”, people who have the qualities to help and support their colleagues. A superb speaker, her closing advice was simply to “Go for it” and that is what we intend to do. I wanted to thank you in person, Helen, for your wonderful talk. The clarity, passion and power of the messaging were simply perfect and the feedback has been spectacular. As I said at the time, “thank you” does not seem nearly enough, but thank you. I was lucky enough to hear Helen speak at the recent UK Space Conference in Liverpool. She was a superb presenter - lively, engaging, humorous, honest and insightful - and gave the audience an inside perspective on her selection and mission to the Mir space station. I am writing to formally thank you for your excellent contribution at the presentation of the Quality Scotland Awards. Feedback shows that the audience was fascinated by your talk and, personally, I am delighted, as it vindicates my choice of guest speaker. The enclosed press cutting from The Scotsman confirms that view. Thank you very much for speaking at the Human Spaceflight Panel for the Royal Aeronautical Society President’s conference this year. The panel discussion was excellent and the feedback outstanding. Your contributions were very much appreciated by the other speakers and attendees. Thank you for the valuable discussion points in both supporting and leading the discussion and for all your contributions on both days of the Conference : it was a great success and would not have been the same without you.